Lemongrass, also called fever grass, is a perennial plant with thin, long leaves that are indigenous to many Asian countries. 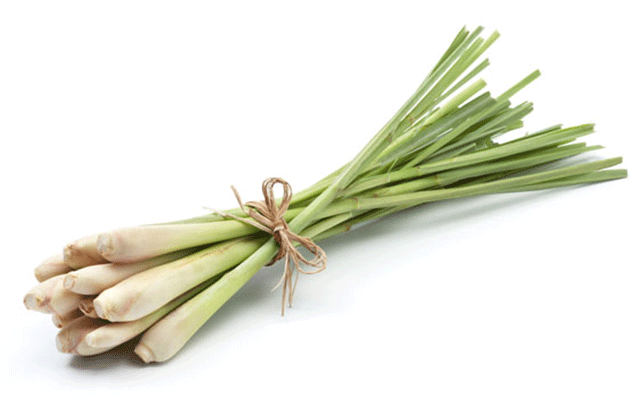 As the name implies, lemongrass smells like lemon, but it tastes milder and sweeter. This herb is used in various Asian cuisines as a flavouring agent due to its potent flavour. It is loaded with many nutrients such as Vitamins A & C, folate, folic acid, magnesium etc and hence is used to cure many ailments and diseases. Lemongrass detoxifies toxic wastes out of the body, as a result of its diuretic properties. Lemongrass possesses anti-hyperlipidemic and anti-hypercholesterolemic properties that support healthy cholesterol levels. It is effective in treating various types of cancers without affecting the healthy normal cells of the body. This also helps in calming nerves and curing insomnia! Now let us talk about 5 quick things that you can do with lemongrass at home! How to make lemongrass ice-tea? 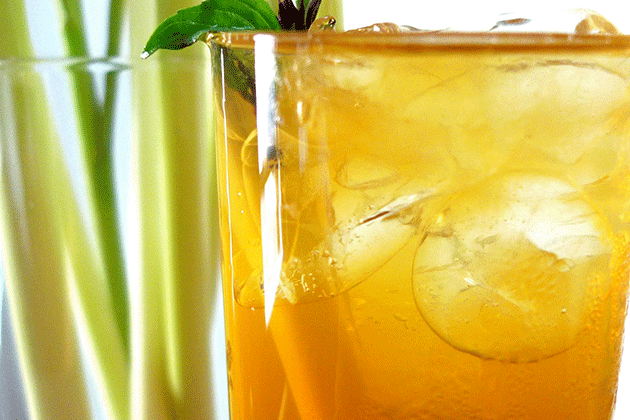 The Lemon Grass Ice Tea, with its invigorating flavour, is the perfect drink to enjoy on a hot summer’s day. The recipe is very simple and it takes just 5 minutes to prepare this drink! You need to combine 2 cups of water,1/4 cup of sugar, 1/4 cup of lemongrass and 2 Tsp of tea powder in a deep non-stick pan. After combining, mix all the ingredients well and cook on a medium flame for 6 minutes while stirring occasionally. Strain the tea using a strainer in a deep bowl. Allow it to cool completely. Just before serving, add 4 ice cubes and 2 lemon slices in 2 individual glasses and pour half of the lemongrass tea mixture into each glass, stir it and serve immediately. 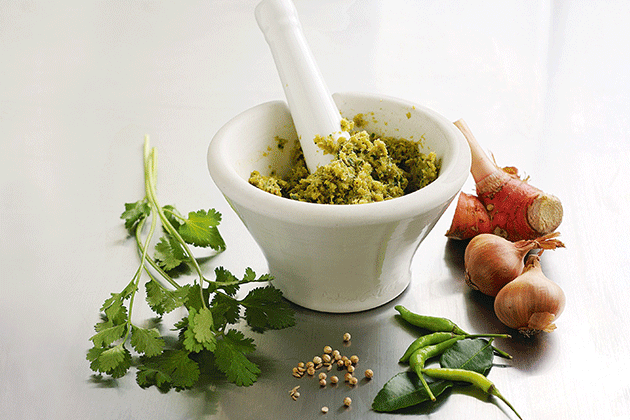 This is an authentic Thai paste made by using fresh green herbs and spices. One of the primary ingredients used here is lemongrass which adds flavour to many vegetables to form Thai curries. You can use this paste for recipes like Thai fried-rice, table-top Thai curry etc. How to make green-curry Thai Paste? Combine 1 and a 1/2 Tbsp of chopped green chillies, 1 Tbsp of roughly chopped garlic, 1/2 cup of roughly ginger, 1 cup of chopped dhania, 1/2 tsp of grated lemon, 1 Tbsp dhania powder, 1 Tbsp of cumin seeds, 1/2 cup of chopped lemongrass, salt and pepper to taste. Now add ¼ cup of water to this and put all of these ingredients in a mixer. Blend it well. Store in an airtight container or in the refrigerator. You can use it as and when required. This is a very popular home remedy to cure a sore throat and indigestion. 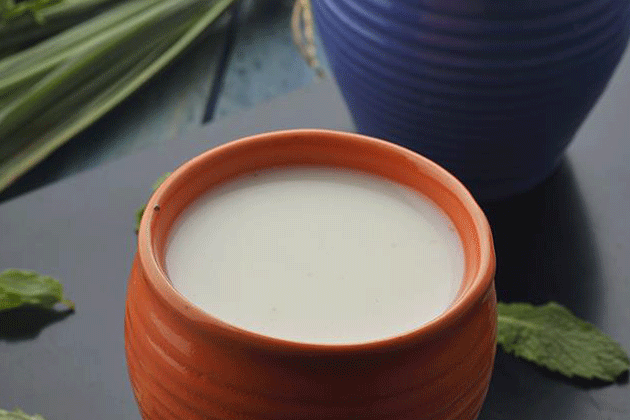 The primary ingredient is lemongrass that along with milk, mint and ginger does its magic in curing the ailments. Combine 1 cup of milk, 1/4 cup of chopped lemongrass, 2 Tsp of grated ginger, 1/4 cup of mint leaves, 1 Tbsp of sugar along with 2 cups of water in a saucepan. Now mix all these well and cook on a medium flame for 5 minutes, while stirring occasionally. Strain the mixture using a strainer and serve warm. Lemongrass oil is extracted through the process of steam distillation of dried lemongrass. This is beneficial in not one but many ways. Its loaded with analgesic, antidepressant, antimicrobial, antipyretic, antiseptic, astringent and bactericidal properties and is a known remedy for muscle and joint pains, for healing wounds, for lowering depression and for limiting the microbial/bacterial growth in your body. The best part is that it can be made very easily and that too at home. We have here a quick video that you can follow to make lemongrass oil at home. 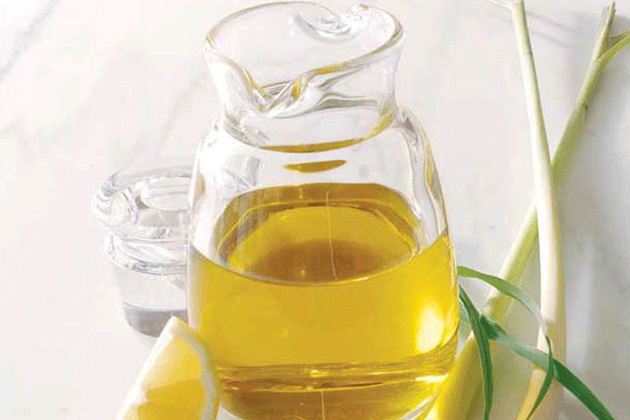 How to make lemongrass oil at home? Lemongrass contains citronella oil, which repels mosquitoes. The process to make it is fairly simple, and you can follow the video below to learn the same. How to make lemongrass mosquito repellent at home? We hope you liked going through our list. Write to us if you have some interesting recipes & remedies to share. We would love to showcase them on our platform.